Delicious yet simple No Bake Cookies. These are for the true Peanut Butter Lover! I love the simplicity of a no-bake cookie. If you follow me on Instagram you may have seen me share a photo of a big pile of mulch. We spent our weekend weeding all our gardens and laying fresh mulch. While it looks beautiful, it’s exhausting work. The weather here was perfect and gorgeous. And it was a good reminder that no bake desserts are awesome to have on hand for summer. You know, when you need something sweet but don’t feel like turning on your oven! 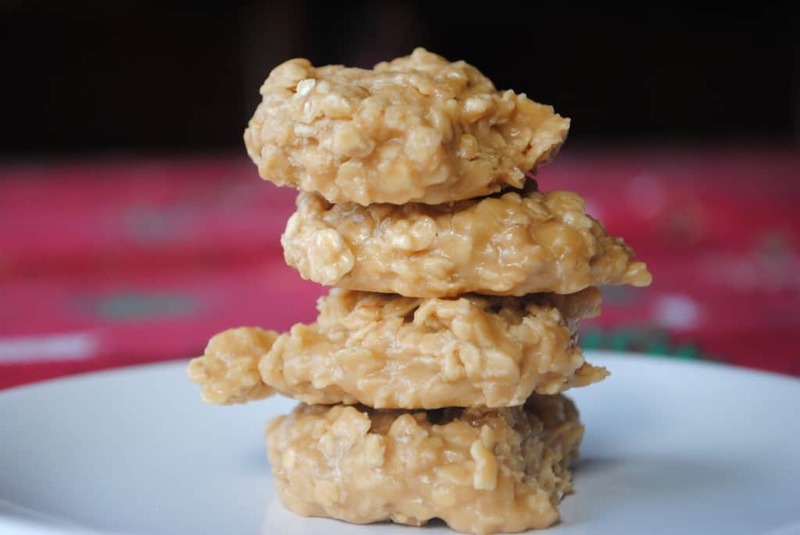 These peanut butter no bake cookies are just the thing. Unlike traditional no bakes, there is no chocolate. I have a family of peanut butter lovers and we needed full peanut butter flavor. Plus, should I remind you they have oatmeal? Peanut butter + Oatmeal = health food. Breakfast. Yeah, I know it’s a stretch, but go with it. I added in some Reese’s Pieces just for fun! These cookies taste like a giant Reese’s Pieces! Seriously. Speaking of Reese’s Pieces…anyone else feel they get neglected sometimes? Second string behind the PB cup? I grew up in the 80’s and going to the theater to see ET when it was first released. Reese’s Pieces had their fame back then, time to bring it back! Right?? In a large pot, add sugar, milk and butter. Bring to a boil over medium high heat. Boil for one full minute. Remove from heat. Add vanilla, salt and peanut butter. Stir until smooth. Fold in oats, stirring until completely combined. Fold in candy. Lay out a large piece of parchment paper on counter. Using two spoons, drop cookie dough by large tablespoon onto paper. Allow to set (about 20 minutes). Store in a covered, airtight container. ENJOY! No Bake Cookies with Double Espresso: these are filled with delicious Mocha Hazelnut Spread and espresso powder. Mom’s perfect treat! Biscoff No Bake Cookies: One of my favorite obsession (biscoff) in a No bake? Perfection! 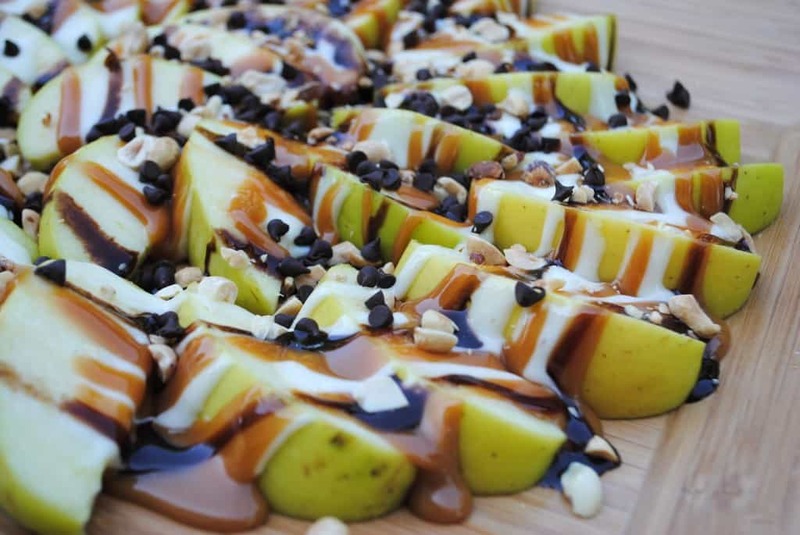 Apple Nachos (perfect summer treat, eat outside cause they are messy then hose off! ): easy, no oven needed! With a house full of kids, no bake cookies are always the way to go! Reese Pieces are the absolute best! Agreed! Sometimes you need quick and no messing with the oven! Mmmmm I heart Reese’s Pieces…there is a bag in my cupboard just waiting for me to bake with them again. 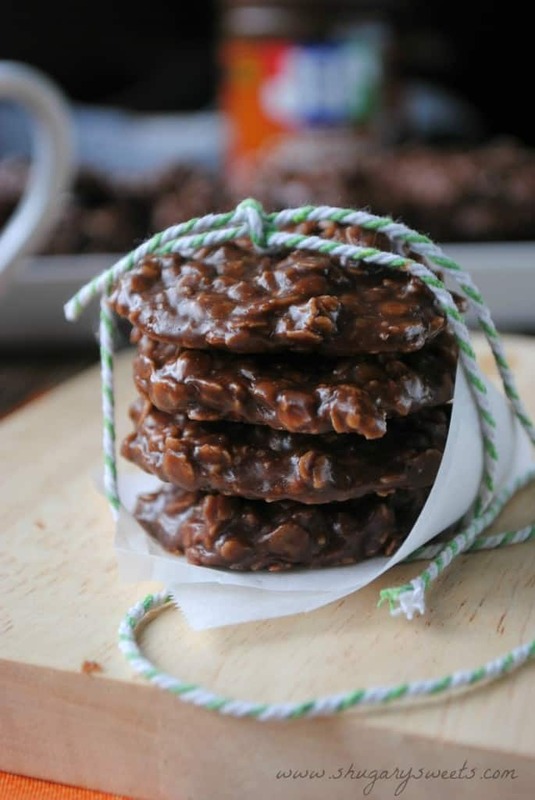 I love that you made no bakes completely peanut buttery! Sounds awesome to me…there is a package in the mail right??? Please tell me that you did not just post this. This is my ultimate weakness PB + Reese’s Pieces. This could be bad…very bad…for my waistline! I did not just post this. Did it work??? Love how simple these look. Haven’t had Reese’s pieces in awhile. This looks like a great treat to try soon! Gotta love a no bake cookies! I adore how peanut buttery these ones are! 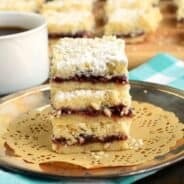 I can not believe that I some how missed all of those amazing no-bake cookies! Peanut butter sounds good. 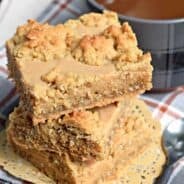 Biscoff sounds amazing (I am seriously addicted!)! The Double Espresso is breakfast tomorrow! These are definitely health food. Oats make everything healthier! I’ll be making tons of no bake in summer here to avoid the A/C! Love how easy these are! Pure peanut butter is never a bad thing either! I love no bake cookies during the summer time! Love no-bake recipes, and you can never go wrong with peanut butter ones! I LOVE no-bake cookies. Especially when the hot weather rolls in… which is hopefully soon! No Bake and Reese’s? Sold! Love no-bake recipes especially in the summer! Thanks Trish! 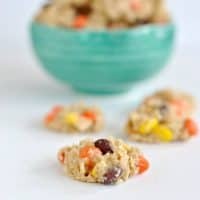 I love how easy no-bake cookies are to make! these cookies look fantastic! I love reeses pieces and definitely feel like they get neglected. I love to put them in with hot popcorn at the movie theather so it’s like i have PB popcorn, yum! PS. Could you delete where I somehow accidentally posted my comment with my email address visible? I would love to eat these for breakfast-what a great idea!!! I can’t believe I’ve never made a no bake cookie-this should be my first! NEVER?? Oh Tanya you are missing out. Seriously!! Oh yum! No-bake cookies are so good! These look amazing, Aimee! Love your apple nachos, too! Thanks Georgia, those apple nachos have been a family favorite for two years now!! Yeah, you would fit right in with my family, you peanut butter addict you!!! Goodness these sound right up my alley. My problem with no-bake cookies is that the are too easy …. so I just want to make them all the time … and then eat them all : ) haha no good for my hips! I feel your pain! good thing I have a gaggle of kids with all their friends who can help a girl out! All peanut butter and no bakes that are loaded with Reese’s Pieces?! I need at least a double batch! Dude, these are too fun. So dangerous…but SO good! 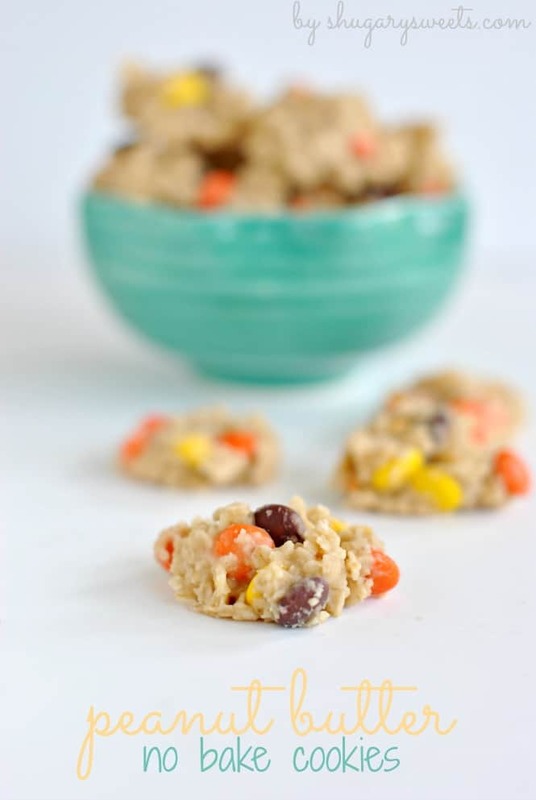 I haven’t made no bake cookies in awhile – I’m pretty sure I need these! I know I am probably in a minority with this but I’ll actually take Reeses Pieces over PB cups any day. These no-bake cookies look fantastic! Nope not in the minority with me! I too would choose the Reese’s Pieces over the cups! With summer approaching much too quickly, I’m always excited to see a recipe that doesn’t involve me turning on my oven. Throw some peanut butter in the mix and you’ve stolen my heart. Can’t wait to try these. Thanks Renee. I love making cookies, but when the weather is warm I dread turning on the oven. Enter no-bakes!! I love that there’s peanut butter AND Reese’s Pieces. They’re our favorite candy! Thanks Anita, one of my favorites too! As much as I love baking I love whipping up in a heart beat some no-bake goodies to surprise my family. Great recipe Aimee! I so enjoy no-bake cookies as well 🙂 there is something so fun about it to me! These looks tasty, I love Reese’s pieces! No bake cookies without chocolate?! Yay! I love chocolate but I feel like I’ve done tons of no bake chocolate stuff and I’m kind of tired of it. Love the Reese’s addition. They just wouldn’t be the same without them! Thanks Erin, they were a delicious twist to an old favorite! I love no bake cookies but I’ve never thought of making them non-chocolate. 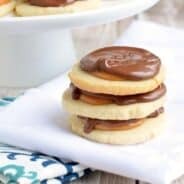 These look great and they would be the perfect thing to satisfy an intense peanut butter craving! I love the addition of Reese’s pieces! This looks awesome… Can I substitute almond milk for the skim milk? You can use whatever milk you have on hand! These are awesome I have a 5yr old and his favorite food is peanut butter he will eat it with a spoon n he love these! I’ll be honest I’ve never tried to freeze no bake cookies. If you do, let me know how it goes! This recipe asks for WAY TOO much sugar. I felt like I was eating pure sugar. I will definitely reduce the sugar next time I try these. 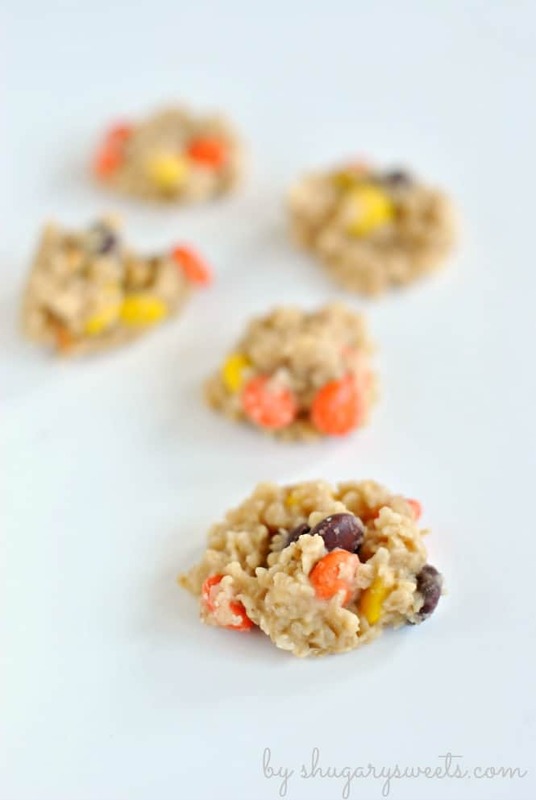 Pingback: Crafty Mama in ME!Reese's Pieces Peanut Butter No Bake Cookies - Crafty Mama in ME!